Eric Bruno is a contributing editor to Dr. Dobb's Journal. He can be contacted at www.ericbruno.com. Of course, the entire list is too comprehensive to cover in this article. However, let's explore the highlights, and those that were most requested by developers like you. The first point of frustration for any person downloading a software package that offers different configurations is the choice of which one to download. Should you download and install the complete package and potentially waste space and time? Or should you risk installing a subset only to require an additional feature set later on? For convenience, NetBeans lets you choose from one of the most common configurations; see Figure 1. These include configurations for Java SE development, Web/Java EE development, C/C++ development, Ruby development, or all of the above. Coming soon are options that will include UML and Java ME. Figure 1 NetBeans offers a stress-free choice of downloads; you can easilychange it later, even after installation. In fact, you can download the NetBeans options with all available packages, but only install a subset of components. With this, you can maintain one NetBeans package, yet allow different developers to install only the component subsets that they need. Regardless of which components you choose to download and install, if your needs change later, it's not too late. The components for each of the standard configurations, and many more, are available for download through the NetBeans Plug-ins dialog; see Figure 2. 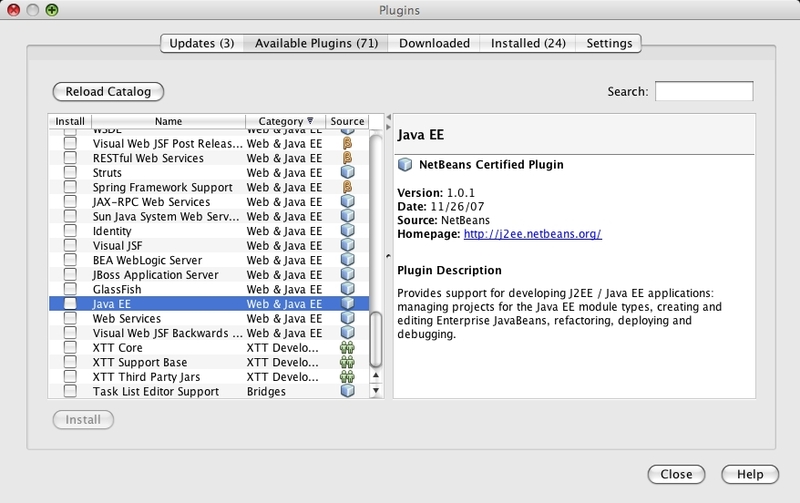 Simply install all of the plug-ins for a particular category (such as the "Web & Java EE" category in shown) and it's as though you downloaded and installed that package right from the start. Figure 2: The NetBeans Plugins dialog allows you to download and install allavailable components at a later time. Improving the NetBeans installation is important, but it's something you won't need to deal with much once it's complete. The changes that you'll appreciate every day are those Sun made to the NetBeans code editor.